Summer is just around the corner and you’ll be soon looking for some fresh and easy everyday recipes! Here’s the recipe of a fruit salad with almonds and Original Balsamic Vinegar: a simple but delicious dish that tastes just like summer! This dish is perfect as summer snack but it could also be served as dessert after a light summer lunch. We suggest you to prepare it with peaches, plums and strawberries but you can actually select the fruit you like the most or simply whatever fruit you have on hand! Wash carefully the peaches, the plums and the strawberries. Then remove the skin and the seeds. Now put the peaches and the plums in a low and large non-stick pan and cook them with 2 or 3 tablespoons of water for 10 minutes. After 10 minutes turn the stove off and add the strawberries; sprinkle the fruit with icing sugar. 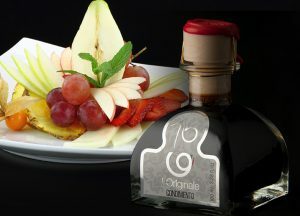 Then arrange the salad in bowls, selecting the right plate for the portion size: it has to be neither too large nor too small; now sprinkle the fruit salad with 1 tablespoon of Original Balsamic Vinegar of Modena Extra Vecchio P.D.O: This Balsamic Vinegar is perfect to improve the flavor of fresh fruit. Now sprinkle the salad again with a bit of powdered sugar. Finally peel and cut the almonds and use them decorare the dish! Previous FIAT 500 and Balsamic Vinegar: a winning combo!